Look for Blue-footed Boobies, Darwin’s finches, Giant tortoises, marine iguanas and other Galapagos icons. 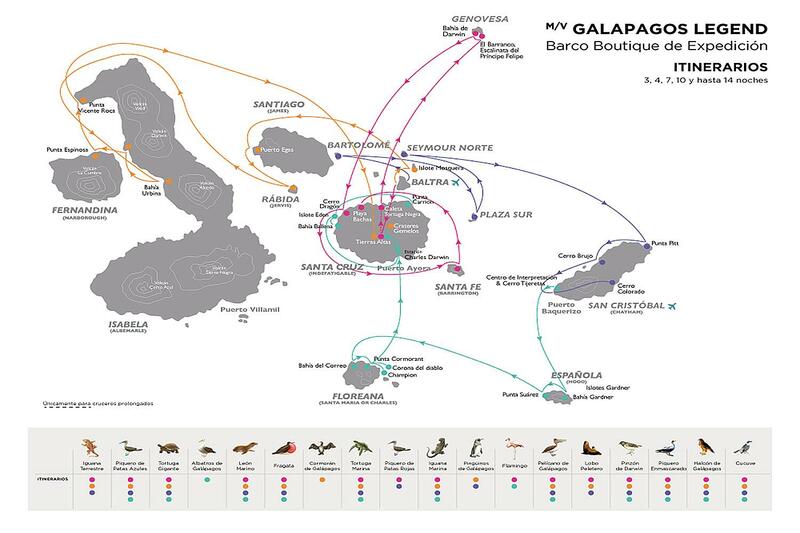 The included 8 day Galapagos adventure offers a wonderful insight into this unique archipelago. There are two visits per day in the morning and afternoon. Expert naturalist guides take you directly to the most fantastic and emblematic locations on each island and introduce you to the mysterious and wonderful secrets of its flora fauna and geology, with walks and hikes of various levels and snorkeling or kayaking. Your Deluxe vessel features exquisite gastronomy and spacious outdoor decks, BBQ terrace, Jacuzzi and pool. 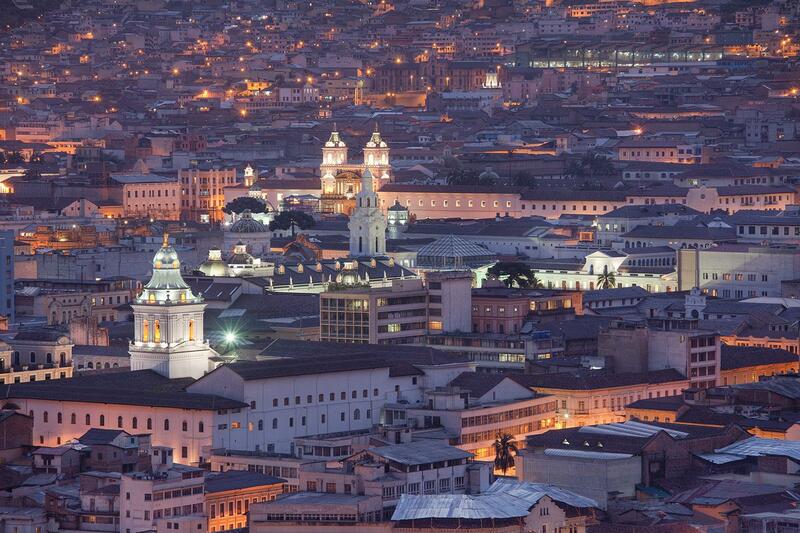 Day 1: Quito (or Guayaquil) Arrival any time – transfer to the hotel. Overnight with breakfast. Day 2: Quito (or Guayaquil) Colonial City Tour & Middle of the World: bustling streets and squares of the largest historical old town in the Americas, a multi-ethnic, artistic and cultural heritage destination. Visit the “Middle of the world” situated at 0º0’0” latitude. Overnight with breakfast. (In Guayaquil Visit Ecuador's largest city port, the romantic Las Peñas neighborhood, the glorious Guayas River and Malecón 2000). Overnight with breakfast. Days 3-10: All-Inclusive Galapagos Cruise aboard M/V Galapagos Legend Domestic flight to Galapagos (not included). All-inclusive 7-night* top quality cruise. Only a special few have the chance to travel through this paradise, sailing on a charming ship, with nautical interior decoration of wood and brass, featuring ample outer decks, sea-view cabins and suites, jacuzzi, pool, bars and more. See prehistoric iguanas, giant tortoises, exotic birds, plants, beautiful landscapes of volcanoes, lava cones and magma flows. Swim and snorkel at any time of the year in the warm clear waters among tropical fish, manta rays, sea lions, swordfish, sea turtles and other marine wildlife. Multilingual naturalist guides lead shore excursions twice a day to a place unlike any other full of wildlife that has no fear of man. Lectures explaining the geology, history, evolution, flora and fauna of the islands are provided in several languages. A fine selection of meals will delight you, from buffet breakfast to gourmet dinners, ice cream festivals, and evening barbecues. Back to Quito or Guayaquil. Overnight with breakfast. Day 11: Quito (or Guayaquil) Transfer out. End of services. *YOUR GALAPAGOS ITINERARY IN DETAIL: The Galapagos Legend ship offers combinable weekly departures allowing you to experience 3-, 4-, 7-, and up to 14 –nights tours including: full board, two daily guided excursions with optional activities such as snorkeling, kayaking, dinghy rides and daily diving tours for license-holding divers. Following are the four alternate Monday-Thursday or Thursday-Monday routes with seven nights in total on board. Contact us to confirm which itinerary your cruise date will take - and also to if you wish to combine with following itineraries to extend your Galapagos cruise experience up to 14 –nights without repeating any visits! ITINERARY A: North-Central Islands 3 nights / 4 days Day 1: Monday - AM – Baltra airport Departure from Quito or Guayaquil to Baltra (2 1⁄2 hours flight). Passengers are picked up at the airport by our naturalist guides and taken on a ten minute bus drive to the pier to board the M/V Galapagos Legend. - PM – Highlands Tortoise Reserve (Santa Cruz Island) Dry landing. In the central highlands of Santa Cruz Island we have our best opportunity to interact at close quarters with totally wild, Galapagos giant tortoises. A short walk among these huge, 600lb, reptiles will also offer the chance for more highland species, especially several species of the famed finches. Difficulty level: easy; Type of terrain: flat & sometimes muddy; Duration: 45-minute drive / 1 ½-hour walk. - OR (For Extended Cruises only) PM - Black Turtle Cove (Santa Cruz Island) Here, we can find four species of mangrove in the extensive tidal lagoon system that stretches for almost a mile inland. During our panga ride through the labyrinth we will spot many turtles, herons of several species, sharks and rays. The experience is otherworldly and seems to transport us back to the beginning of time. Difficulty level: easy; Type of terrain: water; Duration: 1-hour panga ride. Day 2: Tuesday - AM – El Barranco, Prince Philip’s Steps (Genovesa Island) Riding our pangas to the far side of the caldera, red-billed tropicbirds display vociferously overhead while Galapagos fur seals can be seen on the shoreline. Once at the top of the rocky stairway we are immediately met by Nazca boobies, red-footed boobies, mockingbirds and finches that line our way through a palo santo forest until we arrive at an expansive open lava field. Wedge-rumped storm petrels swarm above the lava where we keep our eyes peeled for short-eared owls. Difficulty level: Moderate; Type of terrain: rocky – lava; Duration: 45-minute walk. - PM – Darwin Bay (Genovesa Island) From within the flooded caldera of Tower Island we set foot onto a sandy beach to be greeted by swallow-tailed gulls often said to be the most beautiful gull in the world. Our short, flat, trail leads us past stands of mangroves and saltbush on which we have our best possible looks at nesting red-footed boobies and great frigatebirds. At the tidal lagoon we may also see the rarest gull in the world, our very own, endemic lava gull. Difficulty level: Moderate; Type of terrain: Sand & Lava; Duration: 2 ½-hour walk aprox. Day 3: Wednesday - AM – Dragon Hill (Santa Cruz) Dry landing. Arriving to a small lava dock our first encounters are with marine iguanas that blend-in perfectly to the dark rock. As we walk past large prickly pear cacti we arrive to one end of a long, sickle-shaped, beach with Dragon Hill standing in the distance. Our walk takes us on a circular path, past a shallow lake where flamingoes frequently come to feed. Waders such as stilts, turnstones and sandpipers work the muddy edges frenetically looking for food as we continue inland to a dry, forested habitat where land iguanas nest and burrow. Difficulty level: moderate; Type of terrain: rocky; Duration: 2-hour walk. - PM – Santa Fe Island Wet landing. After a fabulous snorkel in the turquoise waters of the protected bay we may have enjoyed time with sea lions, turtles, reef sharks and spotted eagle rays. Landing onto a sandy beach we are immediately distracted by the abundant sea lions there with us. We begin a walk past a forest of island-endemic giant Opuntia cacti. Here we search for another island-endemic the Santa Fe land iguana, paler than its cousins on other islands. Galapagos hawks and even endemic rice rats are also things to look out for. Difficulty level: moderate; Type of terrain: rocky; Duration: 1 ½-hour walk / 1-hour deep water snorkeling Day 4: Thursday - AM – Bachas Beach (Santa Cruz) Wet landing. Named for some wrecked World War II barges whose ribs are still visible in the sand this visitor site offers great swimming, a lovely walk along the shore and a visit to a lagoon behind the high tide line with wading birds, marine iguanas and sometimes even flamingoes. The two beaches are also favorite nesting sites for green turtles which often leave tractor-like tracks in the sand. Difficulty level: easy; Type of terrain: sandy; Duration: 1-hour walk. - AM- Baltra Airport After the visit, passengers will be transferred to the airport for their return flight to Guayaquil or Quito. - ITINERARY B: Western Islands 4 nights / 5 days Day 1: Thursday - AM – Baltra Airport Departure from Quito or Guayaquil to Baltra (2 1⁄2 hours flight). Passengers are picked up at the airport by our naturalist guides and taken on a ten minute bus drive to the pier to board the M/V Galapagos Legend. - PM – Mosquera Islet Wet Landing. This tiny, low lying islet, covered in coral sand, is set between North and South Seymour Islands. 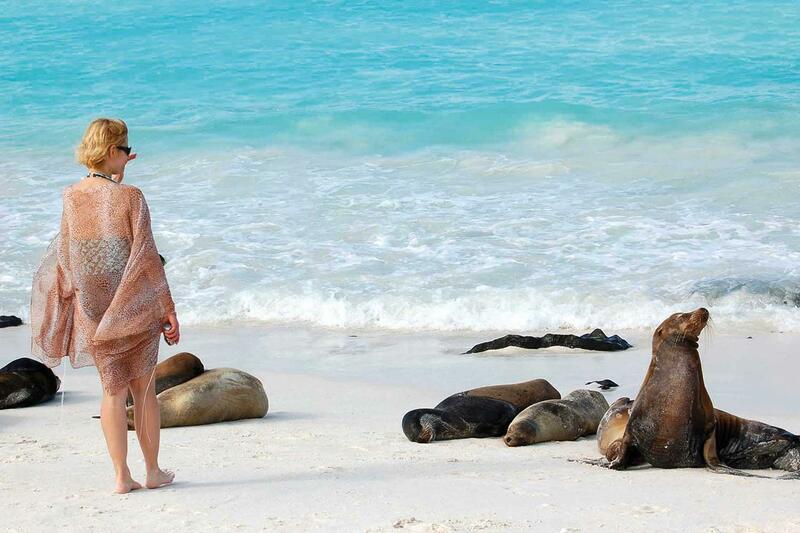 It is home to a group of sea lions that come to laze on the soft white sand. It is a good spot to observe shorebirds as well as herons, lava gulls and boobies. Snorkeling or diving here one can often see sharks, rays and barracudas. Difficulty level: easy; Type of terrain: sandy; Duration: 1 ½-hour walk & snorkeling Day 2: Friday - AM – Egas Port (Santiago Island) Wet landing. The black volcanic sand sets this landing apart from most. It is best known for the dramatic shoreline where we meet a host of species that chose to live between land and sea. Particular among these are the endemic Galapagos fur seals which maintain a small colony at the end of our walk. Other species of note include American oystercatchers, sea lions, waders, herons, lava lizards and even Galapagos hawks. An optional visit takes us to an abandoned salt mine famous in its day for supplying salt to mainland Ecuador. Difficulty level: moderate; Type of terrain: flat & semi-rocky; Duration: 1 1/2-hour walk / 1-hour snorkeling - PM – Rabida Island Wet landing. Lying at the heart of the archipelago this dramatic island, with its distinctive red-sand beach, is home to sea lions, mockingbirds, finches, endemic Galapagos doves and vermillion flycatchers. A walk takes us through a forest of palo santo and cacti to a beautiful overview of the bay. Snorkeling here can be excellent, often with large schools of black-striped salemas, sea lions and the ubiquitous turtles. Difficulty level: easy; Type of terrain: sandy; Duration: 1 1/2-hour walk / 1-hour snorkeling / 1-hour dinghy ride Day 3: Saturday - AM – Urbina Bay (Isabela Island) Wet landing. At the far end of a long, level hike we arrive at a strange phenomenon where large blocks of coral lie completely exposed after a dramatic geological uplift in 1954. Located at the western base of Alcedo Volcano we hope to run into a few very impressive land iguanas as well as some of the volcano’s endemic Galapagos giant tortoises during the wet season. Difficulty level: moderate; Type of terrain: flat & rocky; Duration: 1 ½-hour walk / 1-hour snorkeling - PM – Tagus Cove (Isabela Island) Dry landing. A well-known hideout and deep water anchorage in the days of pirates, Tagus Cove was also one of the few sites visited by Charles Darwin and the HMS Beagle in 1835. A beautiful hike leads us past an overview of Darwin Lake and on to a stunning volcanic landscape revealing Isabela island’s dramatic northern volcanoes. Once back at sea level the perfect activity is to snorkel along a submerged wall with turtles, lots of fish, penguins and potentially flightless cormorants. You might even be tempted by a panga ride or kayak! Difficulty level: moderate/demanding; Type of terrain: steep; Duration: 2-hour walk / 40-minutes panga ride / 1-hour deep water snorkeling Day 4: Sunday - AM – Espinosa Point (Fernandina Island) Dry landing. The youngest island of Galapagos and one of the most pristine in the world. 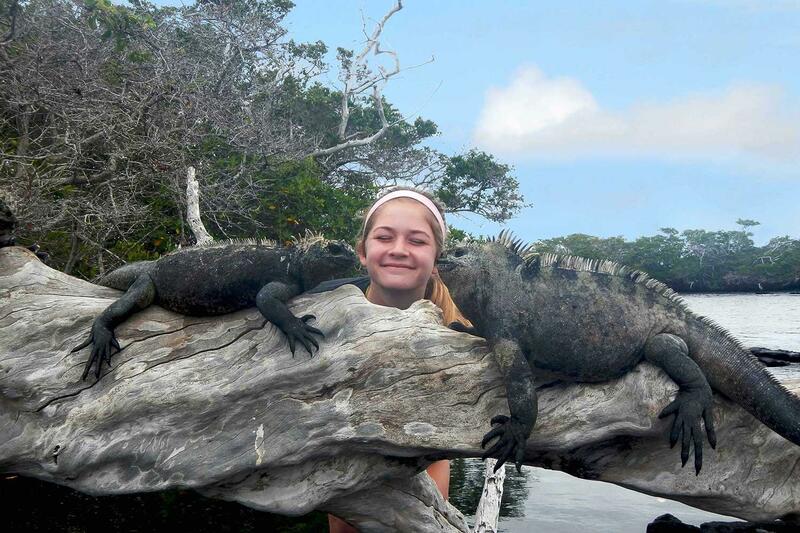 Fernandina is simply the “marine iguana capital of the world”. This desolate volcanic backdrop is home to a huge concentration of these enigmatic reptiles. 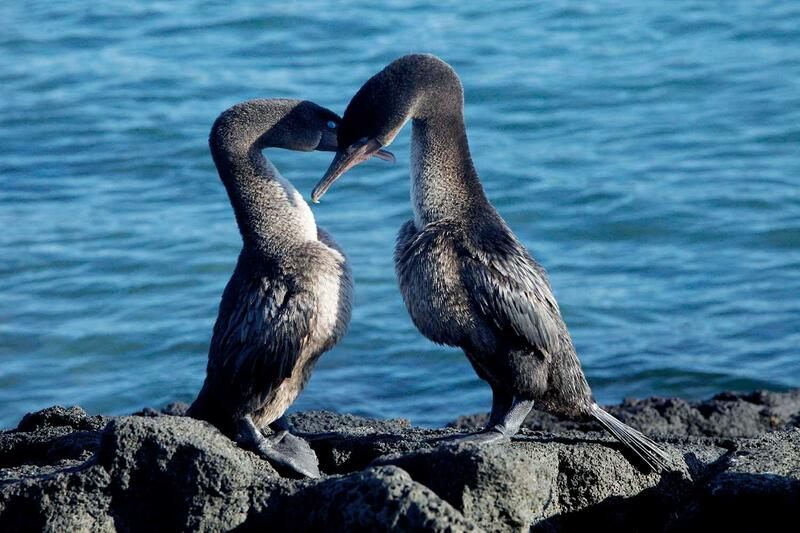 Incongruously, sharing the same shoreline, we can find the diminutive Galapagos penguins. Here we also have the exciting opportunity to snorkel with marine iguanas feeding underwater, penguins, turtles and the bizarre, endemic, flightless cormorants. Difficulty level: moderate; Type of terrain: flat/semi rocky; Duration: 1 1/2-hour walk / 1-hour snorkeling. - PM – Vicente Roca Point (Isabela Island) Great deep-water snorkeling at one of the richest marine havens on Earth, the Bolivar Channel. Accessible by water, we take a dinghy ride along the coast to observe a great diversity of sea and coastal birds; Nazca and blue-footed boobies, noddies, brown pelicans, penguins, flightless cormorants. 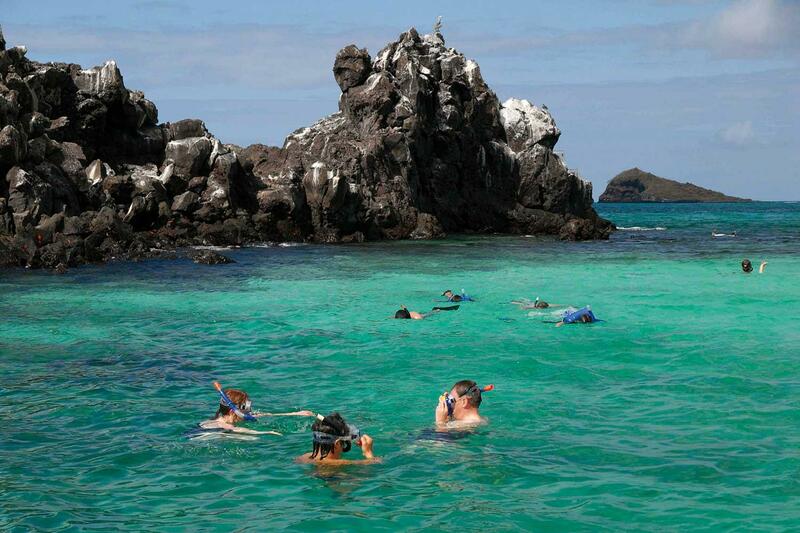 The upwelling of cold water currents in this part of the Galapagos gives rise to an abundance of marine life, a perfect place for deep snorkeling. 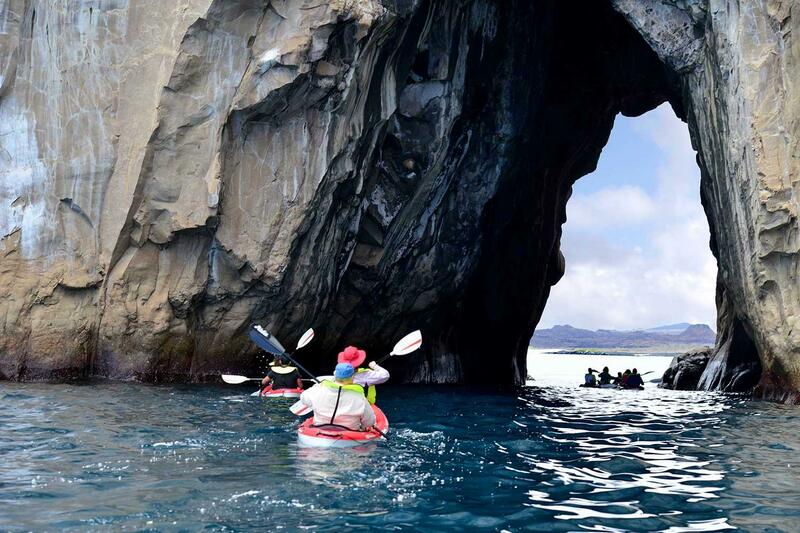 Difficulty Level: moderate / demanding; Type of terrain: water; Duration: 1-hour snorkeling / 1-hour dinghy ride Day 5: Monday - AM – Highlands Tortoise Reserve (Santa Cruz Island) Dry landing. In the central highlands of Santa Cruz Island we have our best opportunity to interact at close quarters with totally wild, Galapagos giant tortoises. A short walk among these huge, 600lb reptiles will also offer the chance for more highland species, especially several species of the famed finches. Difficulty level: easy; Type of terrain: flat & muddy (depending on season); Duration: 45-minute drive / 1 ½-hour walk - OR (for Extended Cruises only) Pit Craters (Santa Cruz Island) A visit to the collapsed, twin sink holes (Gemelos) puts us in a stunning forest of the endemic tree-forming Scalesia. Apart from the dramatic scenery this area is well known for its diversity of passerine bird species. Type of Terrain: Flat & muddy; Difficulty level: Easy; Duration: 45-minute drive / 1 ½-hour hike Baltra Airport After the visit, passengers will be transferred to the airport for their return flight to Guayaquil or Quito. - ITINERARY C: Central-East Islands 3 nights / 4 days Day 1: Monday - AM – Baltra Airport Departure from Quito or Guayaquil to Baltra (2 1⁄2 hours flight). Passengers are picked up at the airport by our naturalist guides and taken on a ten minute bus drive to the pier to board the M/V Galapagos Legend. - PM – Bartolome Dry or wet landing. Considered the most iconic landscape of the entire archipelago the view from the top of Bartolome Island, overlooking thefamous Pinnacle Rock and the austere Santiago Island beyond, is well worth the climb up the wooden boardwalk. This volcanic scene has oftenbeen likened to a lunar landscape. Our subsequent snorkel here might put us face to face with Galapagos penguins, white-tipped reef sharks andplayful sea lions. Difficulty level: moderate; Type of terrain: trail made of 372 steps; Duration: 1 ½-hour walk / 1-hour snorkeling. Day 2: Tuesday - AM – South Plaza Islet Dry landing. Sea lions, swallow-tailed gulls and land iguanas are all present at the landing site. The small island is covered with a carpet of a red succulent studded with Opuntia cacti. At the cliff edge, we spend time watching birds fly past at eye level in the up draught. These include, frigatebirds, flocks of Galapagos shearwaters and of particular note, flights of displaying red-billed tropicbirds. Back at sea level, we once again encounter land iguanas, some of which have hybridized with their resident marine cousins. Difficulty level: moderate; Type of terrain: rocky; Duration: 2-hour walk. - PM –North Seymour Island Dry landing. This flat, uplifted, island is an important spot to see both magnificent and great frigatebird males courting the females byclicking, bill-clapping, shuddering and flapping their wings, all while showing off their grossly inflated, bright red, gular pouch. We willalso likely see courting blue-footed boobies displaying their unique feet while ‘dancing’ to a prospective mate. Sea lions, swallow-tailedgulls, crashing surf and distant views of the Daphne Islands top off a great visit. Difficulty level: intermediate; Type of terrain: rocky;Duration: 2-hour walk, 30 minutes snorkeling. Day 3: Wednesday - AM – Pitt Point & Islet (San Cristobal Island) Wet landing. Sea lions will greet us as we land on the beach and prepare for our climb to a high point on the steep eroded tuff cone.This is the only place in the islands where we will enjoy the chance to see all three of the booby species in the same place. The red-foots willbe perched on the Cordia lutea and small trees, the Nazca’s on the ground near the cliff edge while the blue-foots will be a little furtherinland. Frigatebirds will be all around and the views are breathtaking. Difficulty level:demanding; Type of terrain: rocky; Duration: 2½-hourwalk/ 40-minute snorkeling or kayaking. - PM – Cerro Brujo (San Cristobal) Wet landing. From our pangas, as we head to shore, we are first humbled by the immensity of the stunning cliffs of “Sorcerer’s Hill.” We canenjoy simply sharing the beach with sea lions, snorkeling from shore or take a walk to a hidden lagoon where we might spot black-necked stilts,ruddy turnstones, whimbrels and white-cheeked pintails. Difficulty level: easy; Type of terrain: sandy; Duration: 1-hour walk / 1-hoursnorkeling Day 4: Thursday - AM – Cerro Colorado Tortoise Reserve (San Cristobal) Dry landing. 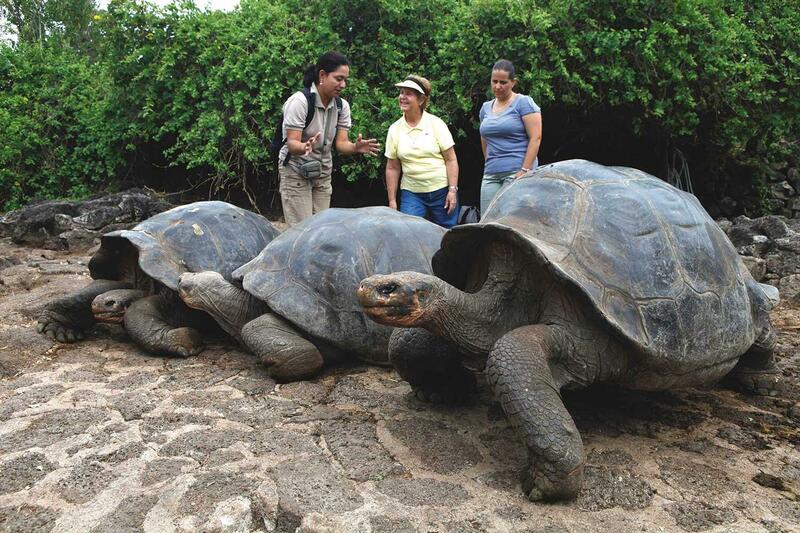 In the moist highlands of San Cristobal we will visit the giant tortoise breeding center ìLa Galapagueraî to witness the mosticonic creature of the archipelago in its various life stages. The tortoises wander in a semi-natural habitat which lends itself to goodphotographic opportunities. The aim of the reserve is to help restore populations of the threatened San Cristobal tortoise back into the wild.In town, there are shops to purchase local handicrafts and souvenirs. Difficulty level: moderate; Type of Terrain: sandy; Duration: 40-minutebus drive to the Reserve / 1-hour visit San Cristobal airport After the visit you will go straight to the airport for your return flight to Guayaquil or Quito. - ITINERARY D: South Islands 4 nights / 5 days Day 1: Thursday - AM – San Cristobal Airport Departure from Quito or Guayaquil to San Cristobal in a 2-hour flight. Upon arrival, passengers are picked up at the airport by our naturalist guides and taken on a ten-minute bus drive to the pier to board the M/V Galapagos Legend. - PM – Interpretation Center & Tijeretas Hill (San Cristobal Island) Dry landing. The interpretation center is full of interesting information and offers the perfect overview to the formation of Galapagos, its significance in the world, threats and conservation efforts. Followed by a hike to Frigatebird Hill (Cerro Tijeretas) we will have great looks at both species of frigatebird, with the bonus of a beautiful view of the bay below. Difficulty level: easy /moderate; Type of terrain: flat/stairs/rocky; Duration: 1-hour visit / 1-hour walk Day 2: Friday - AM – Gardner Bay, Gardner & Osborn islets (Española Island) Wet landing. One of the most stunning beaches in all of Galapagos. The long, white, sandy beach, lapped by turquoise waters is home to a colony of Galapagos sea lions, indifferent to the humans that walk amongst them. The Hood mockingbirds, endemic to this particular island, will be eager to inspect the visitors and satisfy their innate curiosity. Darwin’s finches may also join the throng including the reclusive warbler finch. We can also snorkel here from the beach, in the shallows of the bay. Difficulty level: easy; Type of terrain: sandy; Duration: 1-hour walk / 1-hour snorkeling - PM – Suarez Point (Española Island) Dry landing. One of the highlight visits of the trip. Punta Suarez seems to have everything – a naturalist’s paradise. A slew of marine iguanas and sea lions greet us at the landing site from where our walk continues with close encounters of boobies, endemic lizards, gulls and even a dramatic blow hole. The oldest extant island in the archipelago it is our only opportunity to commune with the endemic waved albatross during their breeding season between April and December. With luck, we can watch their complex courtship display. Difficulty level: demanding; Type of terrain: rocky; Duration: 2½-hour walk. Day 3: Saturday - AM – Post Office (Floreana Island) Wet landing. A very short walk from the beach leads us to the famous Post Office Barrel. Claimed to have been first setup in 1793 by Captain James Colnett it remains the oldest functioning “post office” in the Pacific. The system was that whalers and fur sealers would leave addressed letters in the barrel to be picked up by homeward bound colleagues. In the spirit of maintaining tradition visitors today will often take letters and hand-deliver them in their home countries. Difficulty level: easy; Type of terrain: sandy; Duration: 30-minute walk / 1-hour snorkeling - PM – Cormorant Point / Devil’s Crown / Champion (Floreana Island) Wet landing. On arriving, the observant visitor will notice that olivine, a volcanic crystal, has proffered a subtle green hue on the dark beach. Our walk takes us past island-endemic Scalesia plants to a large, shallow, lagoon often inhabited by a variable number of shockingly pink greater flamingoes. We continue through a forest of palo santo trees to arrive at a powdery white beach, a nesting area of green turtles. As we paddle barefoot in the shallow water we will spot diamond stingrays and white-tipped reef sharks.This coral-sand beach marks the end of our trail, and we head back to the olivine beach we landed on, to swim or snorkel amongst sea turtles, reef fish, sea lions and, on a good day, white-tipped reef sharks. A small colony of penguins resides on Floreana and can sometimes be observed as well. One of the favorite snorkeling sites in the islands. Devil’s Crown, an eroded volcanic cone, is home to an abundance of fish and marine animals. We will swim with big schools of yellow-tailed surgeonfish, salemas and creole fish and with luck may spot turtles, spotted eagle rays, parrotfish, and even hammerhead sharks! The jagged ëcrowní is a roosting area for boobies, noddies, tropicbirds, and frigates. A truly magical place to snorkel. We would expect to see here green turtles, harmless white-tipped reef sharks, an impressive diversity and abundance of fish as well as some playful sea lions often approaching very close, itching to show off their prowess in the water. Champion Islet also happens to be the last remaining home of the island-endemic Floreana mockingbird which we may be lucky enough to see from our pangas. Difficulty level: easy; Type of terrain: sandy & flat; Duration: 1-hour walk / 1-hour snorkeling. Day 4: Sunday - AM – Charles Darwin Research Station & Fausto Llerena Breeding Center (Santa Cruz Island) Dry landing. Once home to the famous Lonesome George, the last tortoise of the Pinta race, the breeding and relocation center is named in honour of his long-time guardian. The center is set in the Galapagos National Park Service where various interpretative buildings are available to visit. The grounds, with large stands of native vegetation, are one of the better places to spot some of the seldom seen Darwin’s finches such as the woodpecker, cactus and vegetarian finches. Difficulty level: easy; Type of terrain: flat; Duration: 1½-hour walk Highlands Tortoise Reserve (Santa Cruz Island) In the central highlands of Santa Cruz Island we have our best opportunity to interact at close quarters with totally wild, Galapagos giant tortoises. A short walk among these huge, 600lb, reptiles will also offer the chance for more highland species, especially several species of the famed finches. Difficulty level: easy; Type of terrain: flat & sometimes muddy; Duration: 45-minute drive / 1 ½-hour walk - PM –Ballena Bay / Eden Islet (Santa Cruz) Wet landing. The perfect spot to enjoy our water activities of snorkeling, kayaking or the glass-bottom boat. Expect to see lots of fish species including king angelfish, surgeonfish, parrotfish, damsels, rays and sharks. From the land portion of the visit there will be sea lions and basking marine iguanas with herons and turtles in the mangrove areas. We might even discover some antique ceramic relics left behind by previous settlements. Difficulty level: moderate; Type of terrain: rocky; Duration: 1-hour walk / 1-hour snorkeling Eden Islet Eden Islet is off the western coast of Santa Cruz. It offers opportunities to see Nazca and blue-footed boobies, reef sharks, and banks of endemic bream fish, either from the panga or while snorkeling. Difficulty level: moderate; Type of terrain: water; Duration: 1-hour snorkeling Day 5: Monday - AM – Carrion Point (Santa Cruz Island) Dinghy ride at the entry of the Itabaca channel in a lagoon with turquoise water, where we can observe sharks, blue footed boobies, and different kinds of fish. Difficulty level: easy; Type of terrain: none; Duration: 1 hour dinghy ride Baltra Airport After the visit, passengers will be transferred to the airport for their return flight to Guayaquil or Quito. Designed specifically for cruising the Galapagos Islands, the Galapagos Legend offers all the amenities of a larger cruise liner yet still has the intimate feel of family-style cruising. She offers unique expeditions allowing visitors from around the world to enjoy the magic of the archipelago Darwin made famous. M/V Galapagos Legend is without formality but maintains excellence in quality services. Panoramic windows, ample social areas and with only one hundred people on board you will enjoy exclusivity and a personalized attention. The charming and elegant cabins and suites range in size from 11 to 23 square metres, fully carpeted with ocean views, closets, their own private bathrooms, hot and cold water, hair dryers, safe deposit boxes, air-conditioning and Video system with LCD TV, music, activities, itineraries and consumption on board. Galapagos cruise with sea view Standard Plus cabins with air-conditioning and private facilities – all inclusive – full board. Accommodation in air-conditioned cabins with private bathroom. Daily visits to the islands with English/Spanish-speaking guide. Briefings and lectures on board. Transfers to/from the Islands from/to the ship. Air ticket from Quito / Guayaquil to Galapagos: $449 per adult, $315 per child under 12 years of age, issued in connection with cruise schedules, prearranging and assuring logistics, luggage and passengers transfers from airports to port - ship and back, documentation. 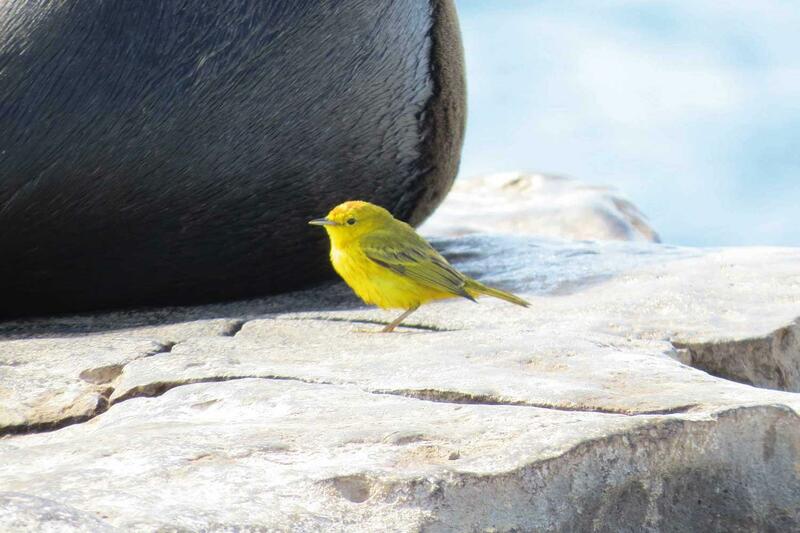 If any other flight to / from Galapagos is used, an operational non-refundable fee of $90 net per person must be charged, above services will not be provided except for dinghy ride to / from the ship. We are not responsible for passengers who miss their cruise or other services due to independent arrangements delays. Entrance fee to Galapagos National Park: $100 adult, $50 children under 12 years of age. Fuel surcharge: $50 x 3/4 nights, $100 x 7 nights, $150 x 10/11 nights and $200 x 14 nights cruise. Alcoholic and non-alcoholic beverages. Any meal, air ticket or service not specified. Medical Services & travel insurance. Tips & personal expenses. Tipping suggestion per day per person, $20 for crew & $10 for a naturalist guide. 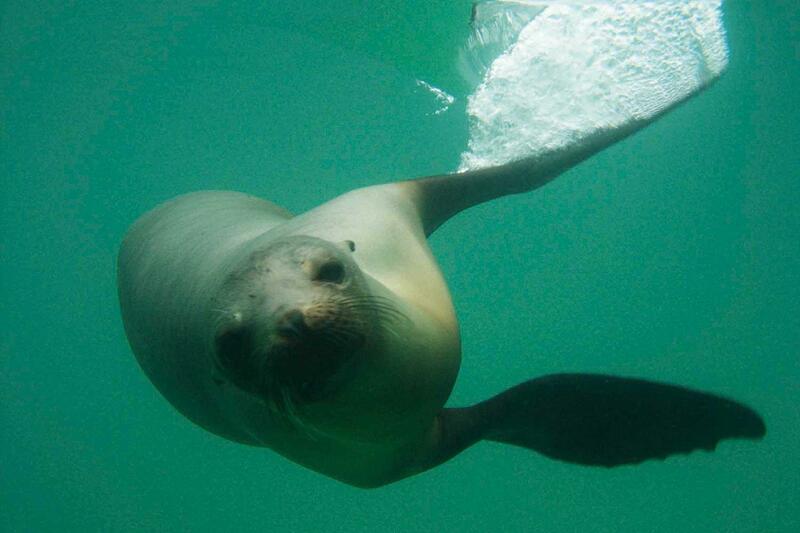 Scuba diving option during GO cruises: $326, half day tour. More information upon request. Wet suits rental: $25 for 3/4 night cruises, $50 x 7, 10, 11 nights, $75 x 14 night cruises. Kayak rental: each use per person $30. Internet plans available upon request starting at 100MB or unlimited WhatsApp. Deposits Reservations require a non-refundable deposit of 20% at the time you receive a booking confirmation from Expeditions Online. A payment link will be sent to you and this may be paid by major credit card. Bookings within 60 days of departure require full payment. Final Payments Balances are due 60 days prior to departure. Cancellations All requests for cancellation must be received in writing to Expeditions Online. If cancellation occurs within 60 of departure the cancellation 100 % of the total price. We strongly recommend that you obtain adequate trip cancellation insurance. Exclusions Please refer to the exclusions carefully. Flights from mainland Ecuador are not included nor is the Galapagos National Park Tax and other fees. Possible fuel surcharges may also apply. Booking Terms - Please read carefully the General Booking Conditions for Expeditions Online. This voyage is operated by Klein Tours Galapagos Cruises and you additionally travel under their terms and conditions as the operator as well as of the Shipping Company/transport carrier. Details will be forwarded to you at the time of booking.